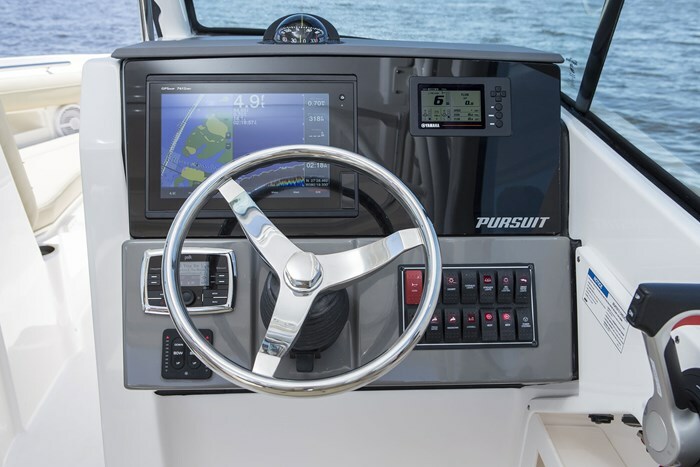 After introducing two new dual console models in just the past two years, the DC 325 and the DC 295, Pursuit’s DC 235 Dual Console is this Fort Pierce, Florida boat builder’s latest dual console offering and the smallest of four such models. Pursuit Boats, part of the S2 Yacht Group which includes Tiara Yachts of Holland, Michigan, offers a total of sixteen models of Offshore, Center Console, Sport (Center Console) from twenty-eight to forty-one feet including these four Dual Consoles, and one outboard-powered Sport Coupe express cruiser, the SC 365i. 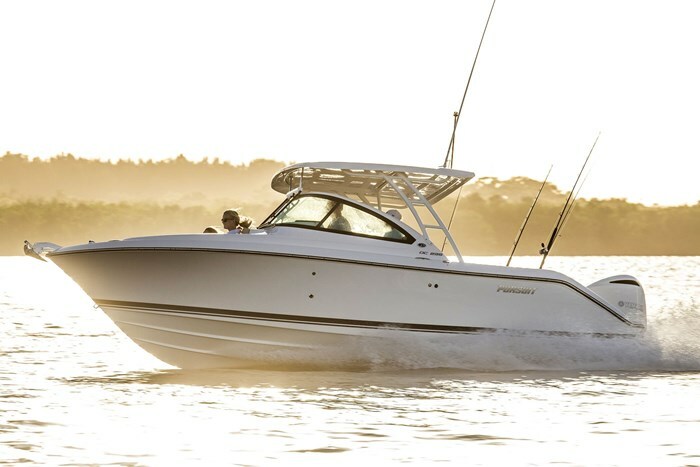 Built on a brand new hull design which it shares with the C 238 Center Console, the DC 235 features high freeboard, bow flare, a molded one-piece deck and cockpit liner, plus twin integrated transom platform extensions outboard of the engine with center walk-across access ahead of the engine to facilitate watersports and fishing accessibility. Concealed within the starboard underside of this platform is a pull-out, flip-down telescopic, three-step boarding ladder. A walk-thru transom door leads from the starboard side platform to the DC 235 cockpit. 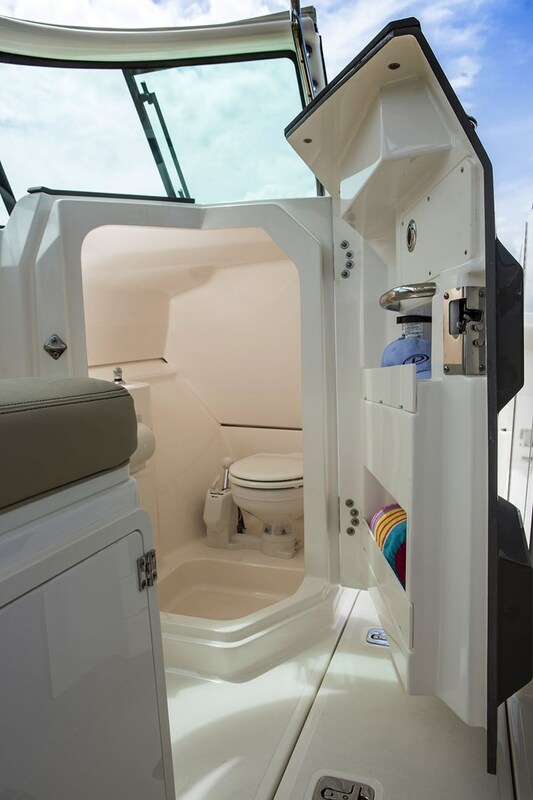 The articulating hinges on the two-person flip-down transom seat are connected with the transom coaming pad which then rises to a seatback when the seat is in use. On the transom is a lighted fifteen gallon recirculating livewell in oceana blue with a plexiglass lid. On the port side of the cockpit is a unique rear-facing convertible lounge seat with storage below. 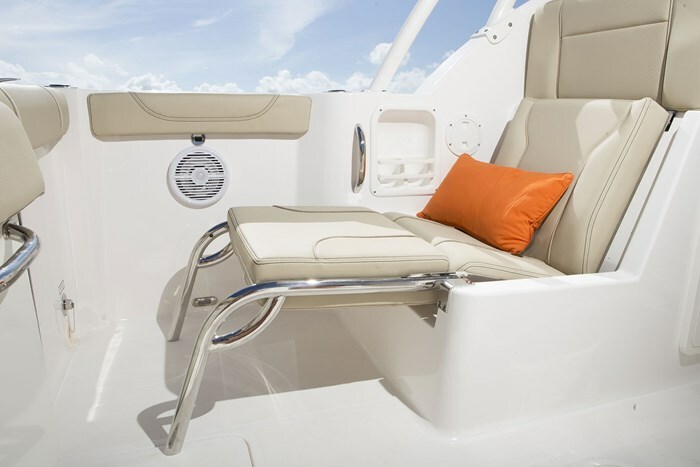 The flip-over-and-down seatback converts this seat into a lounge, and with a filler cushion which fills in the end of this lounge to the transom creates an L-shaped lounge seat with the transom seat flipped-down. 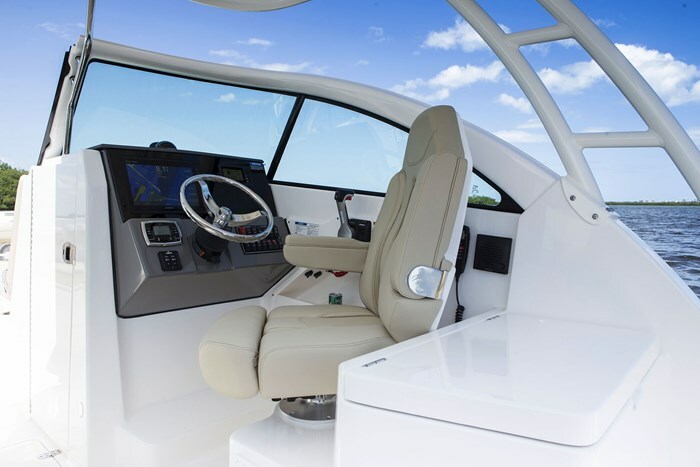 Ahead of this seat is a fixed forward facing passenger seat and on the starboard side, a high-back, swivel, adjustable helm chair with forward flip-up bolster and flip-down armrests. 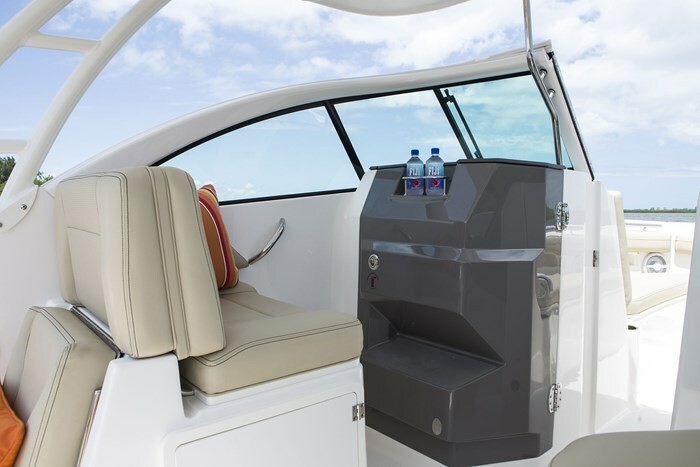 Aft of the helm chair is a standard molded-in entertainment center with sink, pullout sprayer, cutting board, and insulated cooler with fibreglass lid. 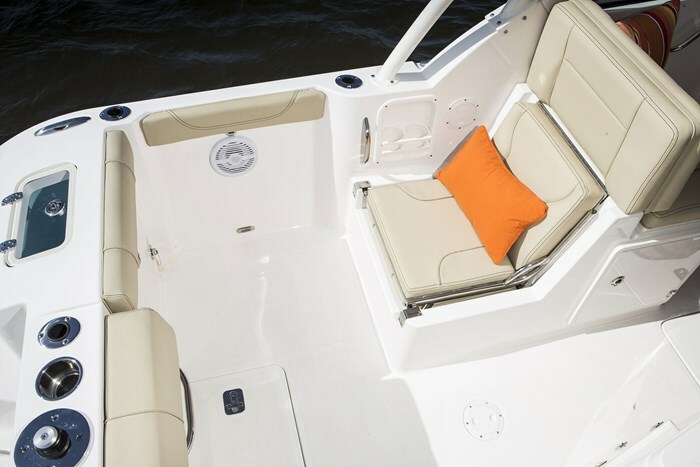 A finished in-floor storage compartment between the helm and passenger seats is ideal for large items such as fishing rods and watersports accessories. Within the helm console is another compartment with dedicated storage and room for lots more. The passenger console incorporates the molded head compartment complete with porcelain toilet plus a sink with pullout cold water shower wand. Through the high walk-thru windshield with its custom molded, resin infused, gelcoated frame are padded fronts of the two consoles allowing forward-facing lounging on the bow seats. 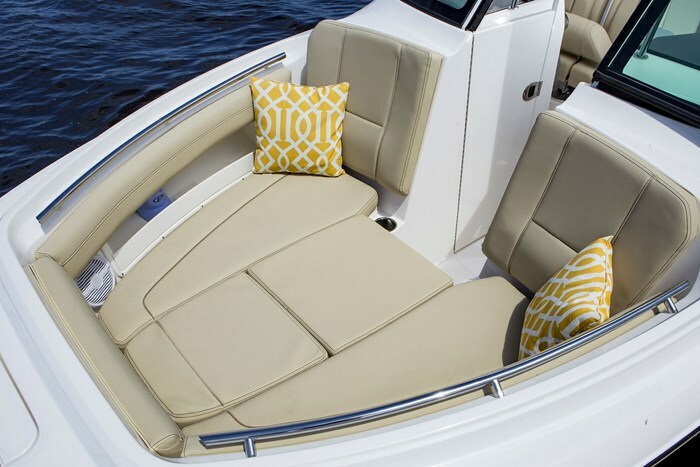 Beneath each of these seat bottom cushions is a finished and insulated storage compartment. Beside each is in-coaming storage, USB charging port, plus recessed stainless steel grabrails and drinkholders, and up front, a flush-mounted integral anchor locker with fibreglass lid and complete with standard anchor, rode, and roller. At the helm, a stainless steel wheel with hydraulic steering is standard as are auto-retract trim tabs with indicators. A 12-volt power outlet is provided as is a dual USB charging port. 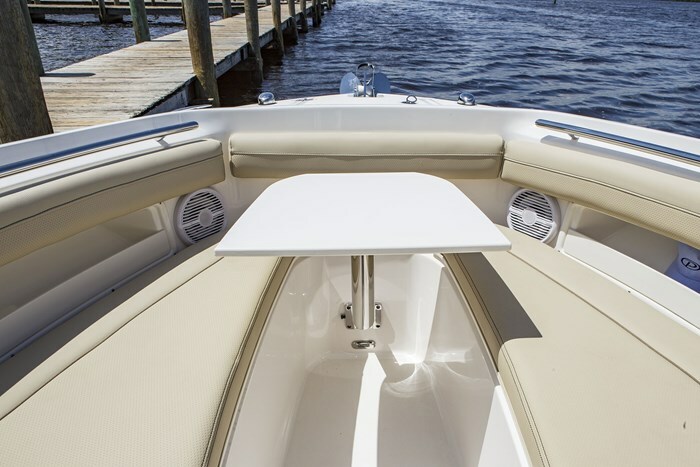 Power for the DC 235 is available from either a 250 or 300 horsepower Yamaha outboard. With the Yamaha F300, Pursuit’s test results show optimum cruising speed of 31 mph at 4000 RPM yielding a 235 mile range and with a top speed of 47 mph. Other notable standard equipment includes floatation foam filled infused fibreglass structural stringer grid system with molded fibreglass finish, cockpit raw water outlet with quick-connect 25-foot hose, LED cockpit lighting, and four stainless steel rod holders. Notable optional equipment includes your decision to go with Sunbrella® canvas covering in four colour choices of a bimini top with connector panel and side curtains plus aft or drop curtain, or choose the resin-infused, vacuum-bagged fibreglass hardtop complete with connector panel and side curtains plus aft or drop curtain. Then you can further choose bow, engine, and instrument covers, several hull and bootstripe colour choices, a white painted engine, Garmin GPSMAP 7612 XSV chartplotter, tilt steering, anchor windlass, blue LED accent lighting, underwater lighting, stereo, bow table with filler cushion, transom rod holders, ski-tow pylon, and if you choose the hardtop, you can then further choose spreader lights, rod rack, and outriggers.